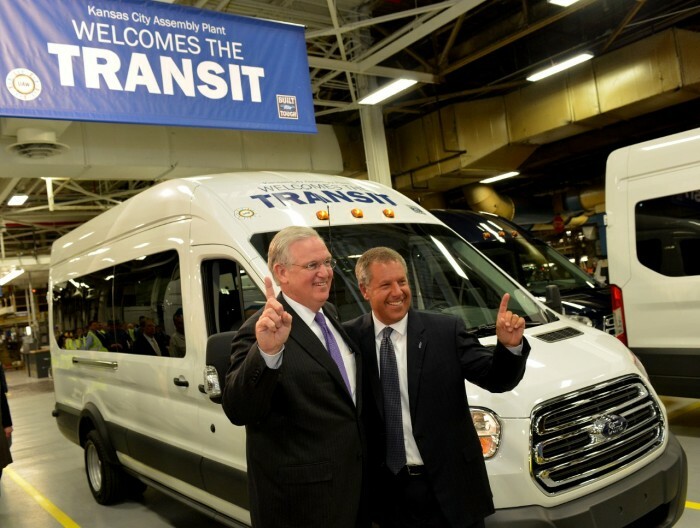 Joe Hinrichs, Ford president of The Americas (right), and Governor Jay Nixon of Missouri at Ford’s Kansas City Assembly Plant, celebrate the start of production of the all-new 2015 Ford Transit. 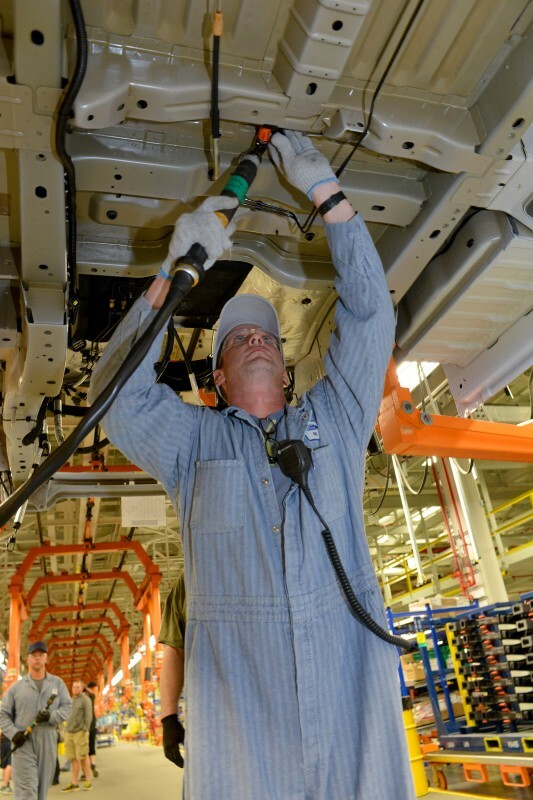 Photo by: Sam VarnHagen/Ford Motor Co.
Production for the Ford Transit van is underway at the Ford Kansas City Assembly Plant, and the occasion was celebrated accordingly yesterday by the plant’s 2,000 new employees. 2,000 new jobs to accommodate production of the Transit van were made possible by Ford’s $1.1 billion investment. Ford is now more than three-quarters of the way toward completing their goal of creating 12,000 new hourly jobs in the U.S. by 2015. More than 5,000 hourly and salaried employees will be hired in 2014 alone. Tim Giles works under a Transit on the chassis line. 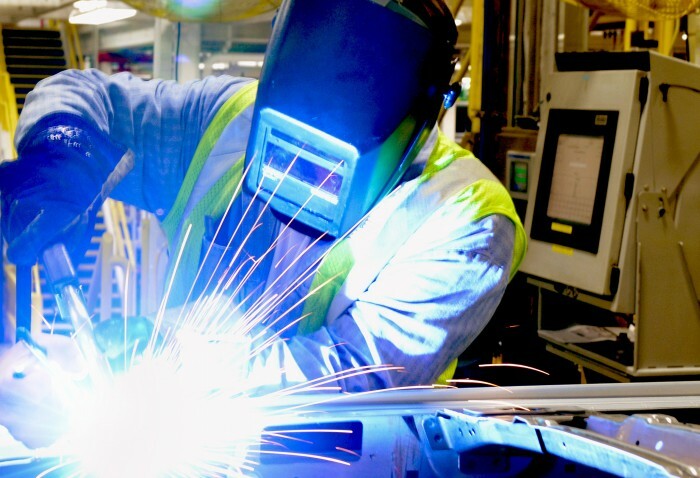 Photo by: Sam VarnHagen/Ford Motor Co.
John Perks, a welder in the body shop, welds metal for a Transit roof. 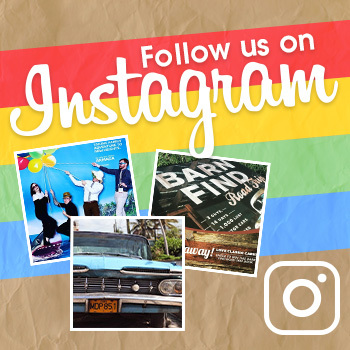 Photo by: Sam VarnHagen/Ford Motor Co. Creating 2,000 jobs at the Ford Kansas City Assembly Plant is another facet of Alan Mulally’s One Ford plan, which ensures global uniformity and quality by leveraging global assets and using common platforms where applicable. The brand-new Ford Transit van will replace the outgoing E-Series (formerly the Ford Econoline). Both the Transit van and the E-Series will be sold simultaneously so that the transition for customers is more seamless. Ford has said that it will continue to build E-Series cutaways and stripped chassis for much of the next five years. Jarvis Ford (left) and Joe Creason (right) work together on a right-hand door in the Transit body department. Photo by: Sam VarnHagen/Ford Motor Co. The Ford Kansas City Assembly Plant is currently responsible for the production of Regular, Super, and Crew Cab versions of the F-150. 4,878 employees work on three shifts at the plant, which now houses a 437,000-sq-ft stamping facility and 78,000-sq-ft paint shop. 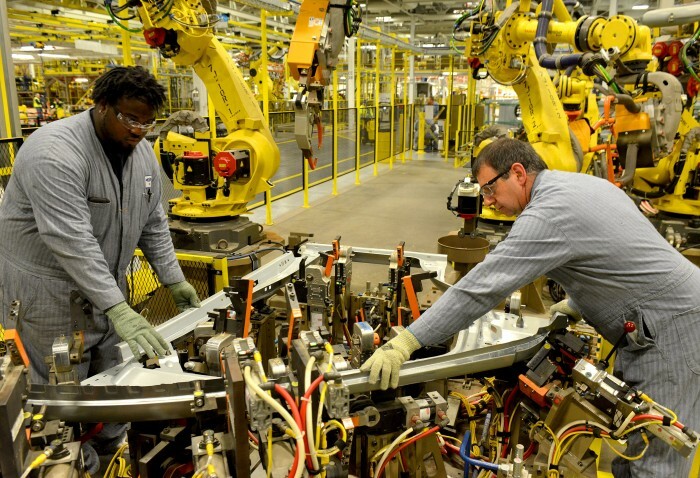 Ford’s $1.1 billion investment also secured 550 new robots for the body shop, 700 new assembly tools for trim and chassis, and 18 conveyer systems.